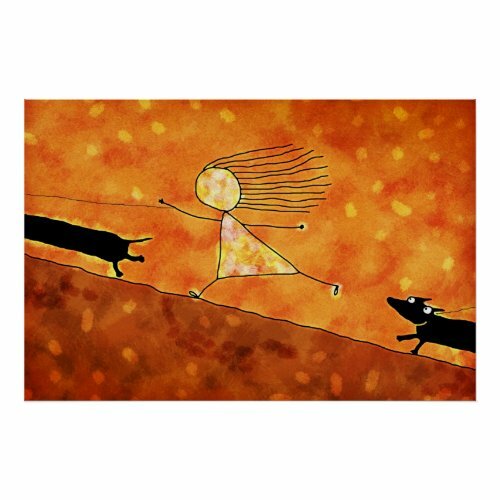 Funny, humorous, art poster featuring a young girl getting pulled by her pet Dachshund, who is smiling and having all the fun, at the other end of the leash, while they are out for a walk. A fun, cute, wonderful art poster to liven up your home/office/work/living space. Great for home decor, decor of living room, daughter's room, office wall, business premises and more. Add a touch of humor to your walls. Makes a fun gift for friends and family, especially the pet owners, dog people, Dachshund lovers! You may even get this poster framed, when ordering!